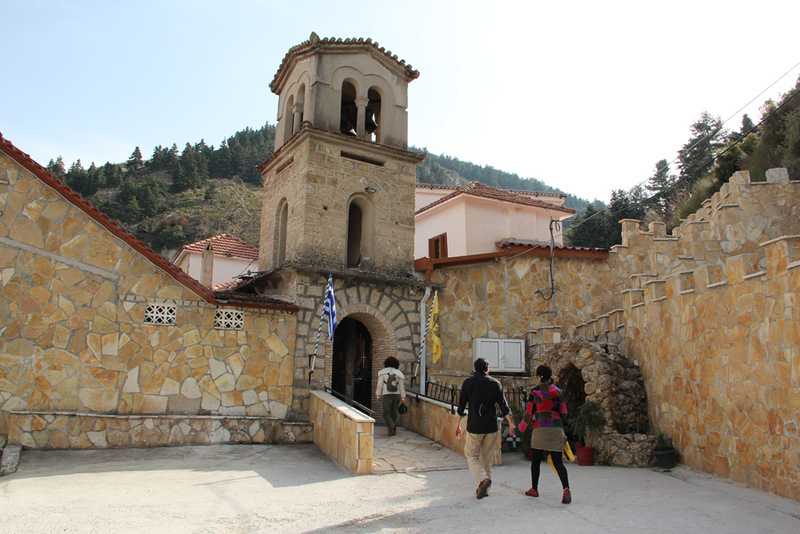 The mountains around Daphne’s Club are literaly littered with interesting churches and monasteries. Most of them can be visited in combination with other historical monuments or with areas of great natural beauty. 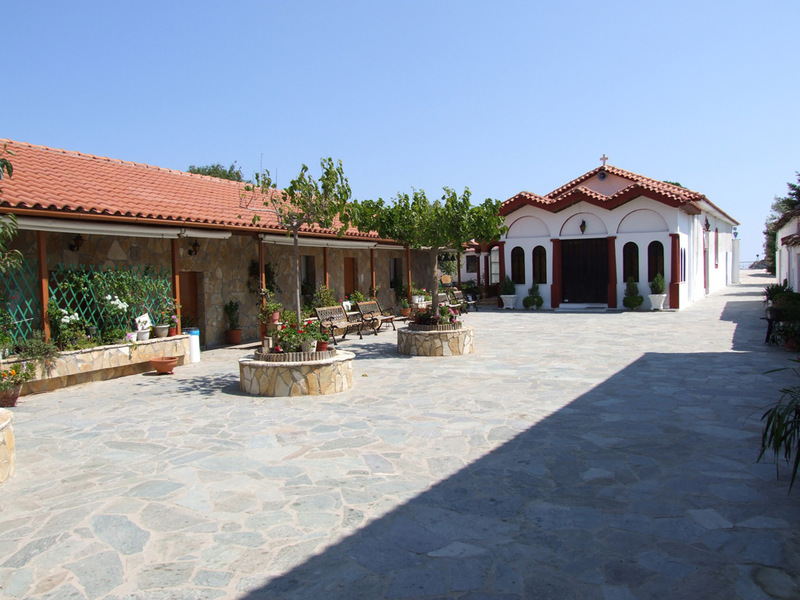 The monastery of Panagia Korfiotissa is a favourite among Daphne’s Club guests. 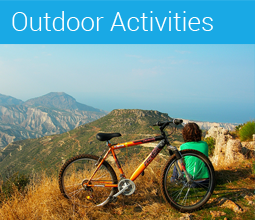 Not only is it extremely historical, it also offers the best helicopter views of the Corinthian Gulf! To reach the monastery, take the road to Kamari, then rurn left after the main church (there is a green sign). Continue straight, up the mountain. 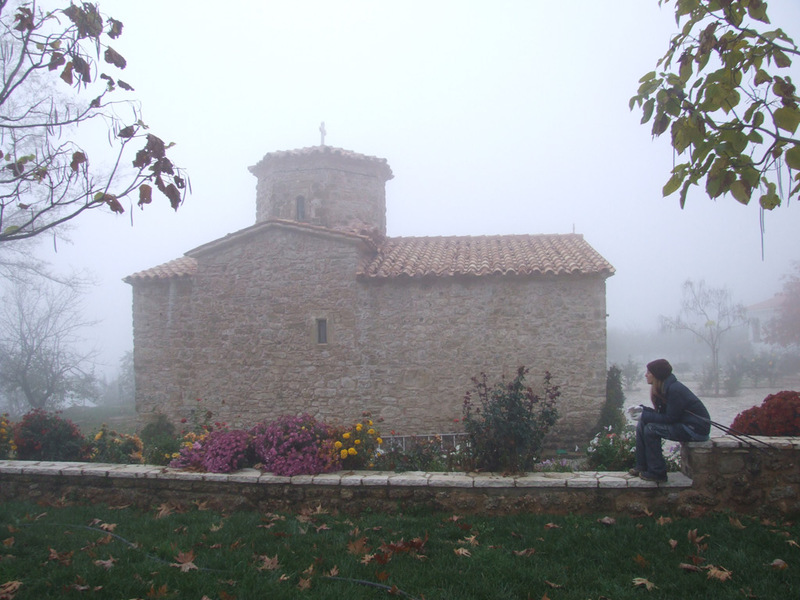 This quiet and solitary monastery is perched in the middle of a beautiful hill full of vines and plane trees. The best way to approach it is by foot, up the relatively deserted road. The distance from the main road is a mere 3 km, so it is quite feasable to attempt the uphill road, cleaning your mind and purifying your spirit as you approach the holy place. 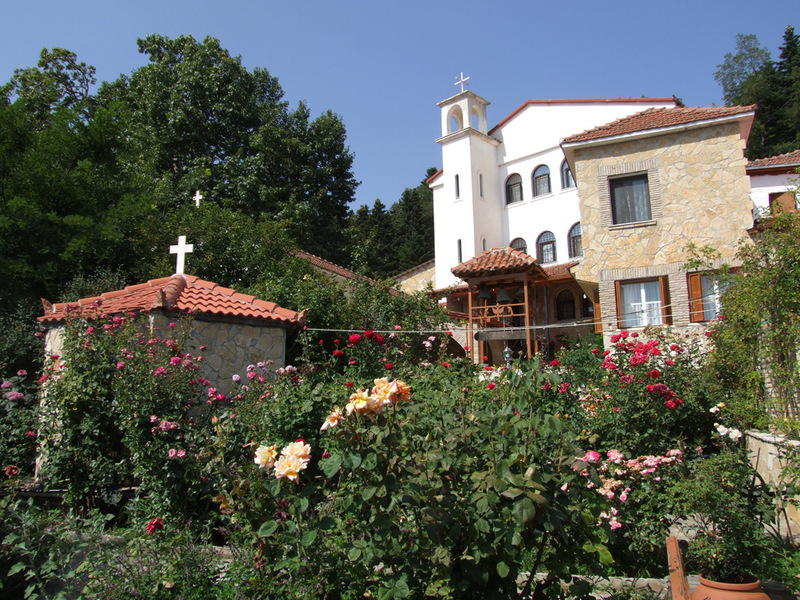 The monastery is very old, probably from the 10th century, but it has been recently and beautifully renovated and you will enjoy the building and garden as much as the peace and quiet! To reach the monastery head for Kiato, then follow the uphill village road towards Nemea. You will see the signs for the monastery a few kilometres after the village Kryoneri. 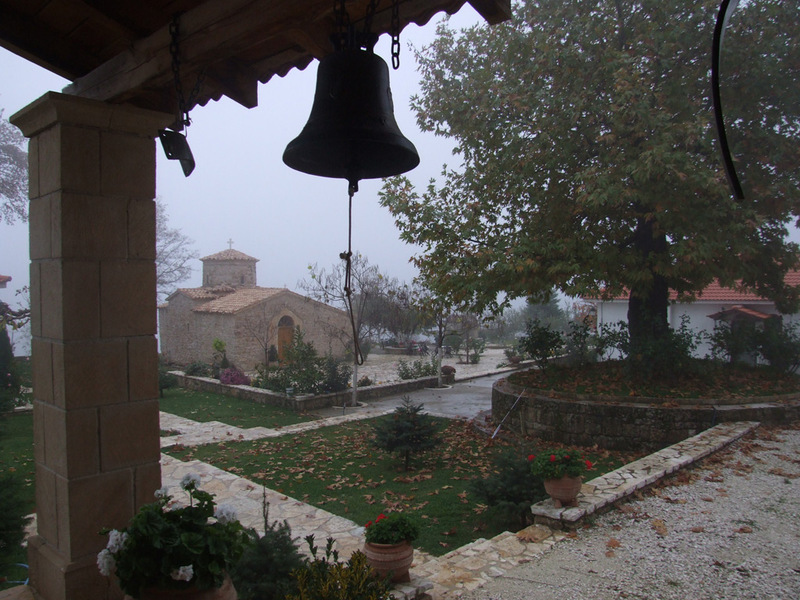 The monastery of Agios Vlassis, in the village of Upper Trikala, is an oasis of peace. And its well-kept flower garden is a real beauty! Admire the icon of Saint Vlasis, the finding of which in the surrounding mountains led to the founding of the monastery; the wooden temple crafted by master Skordilis; and the religious icons painted by N. Santorinaios. 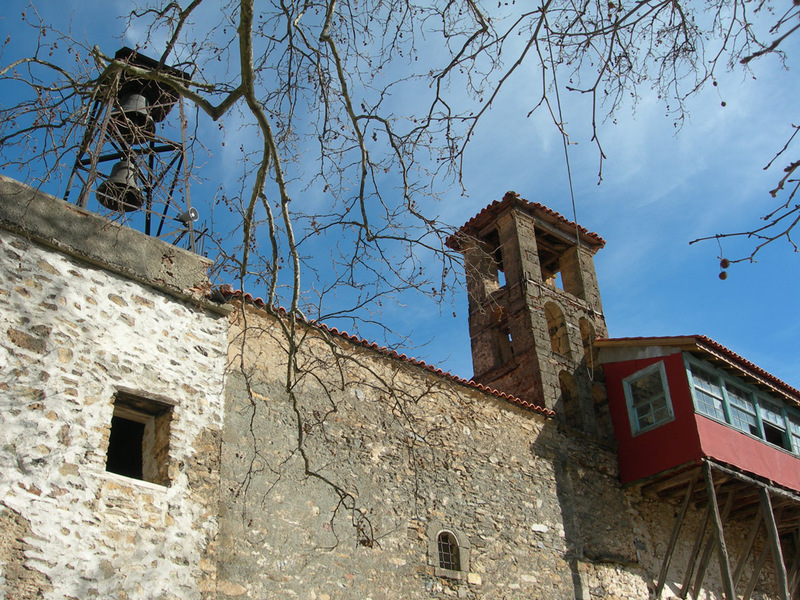 To reach the monastery follow the sighns to Ano Trikala, then continue up the mountain towards the Ziria sports centre. You will meet the monastery on your left hand side. 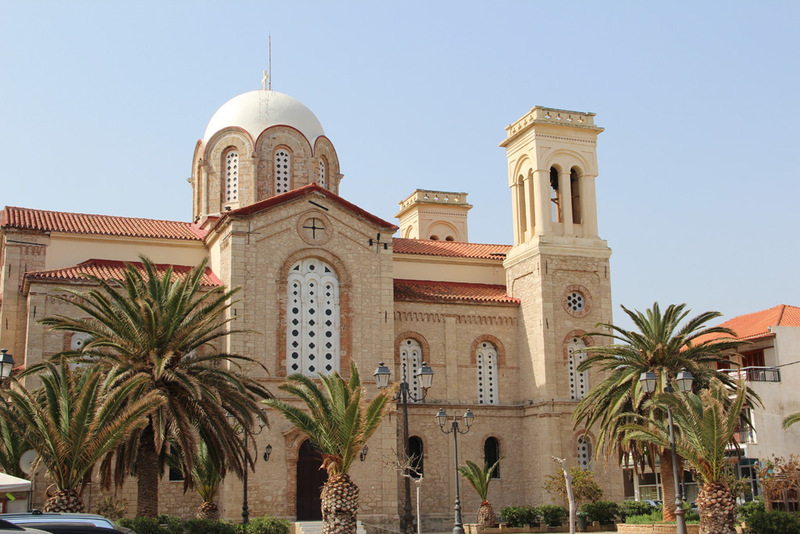 A short drive from Loutraki you will find the monastery of Osios (“the Blessed”) Patapios. The monastery, perched high in the mountain and offering spectacular views of Loutraki, the entrance of the Corinth channel and the north coast of the Peloponnese, is itself is relatively new (it was built in the 1950s), but there is a cave in which lies the the holy shrine of Osios (“the Blessed”) Patapios (whose relics were found in 1904) with exceptional old Byzantine murals, dedicated to Osios (“the Blessed”) Patapios, Osia Ypomoni (St Patience) and Osios Nikonas (Holy Nikon the Metaniote). The murals, dating back to the 11th century AD, are relatively well preserved in the interior of the cave, where it is forbidden to take pictures. 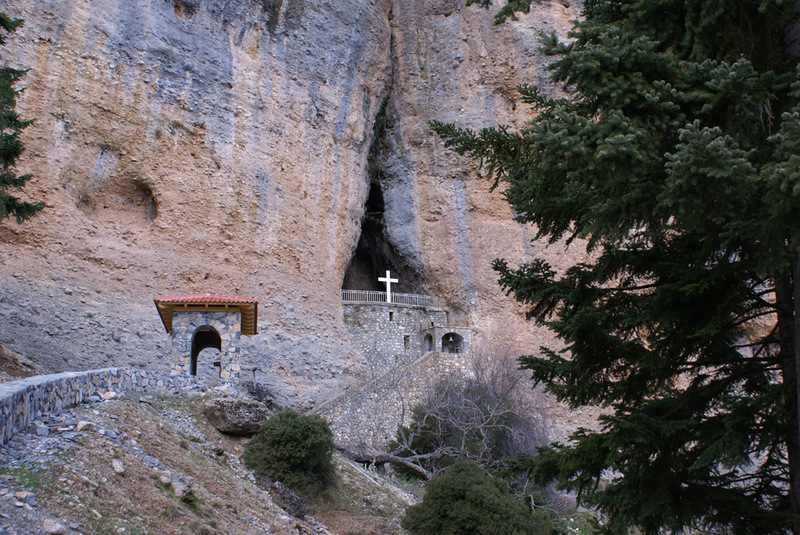 This miniscule monastery built inside the rocks, called “Panagia tou Vrachou” (Madonna of the rock), is a strange and interesting place to visit. Built inside a rock, it has two stories, of which the upper one was used to store foodstuffs. It was used during the Ottoman occupation as a safe haven from persecution by the local Greeks by the Ottomans. You can visit it on your way from Karia to Feneos. At the village Kato Tarsos turn right and follow the signs up the mountain. 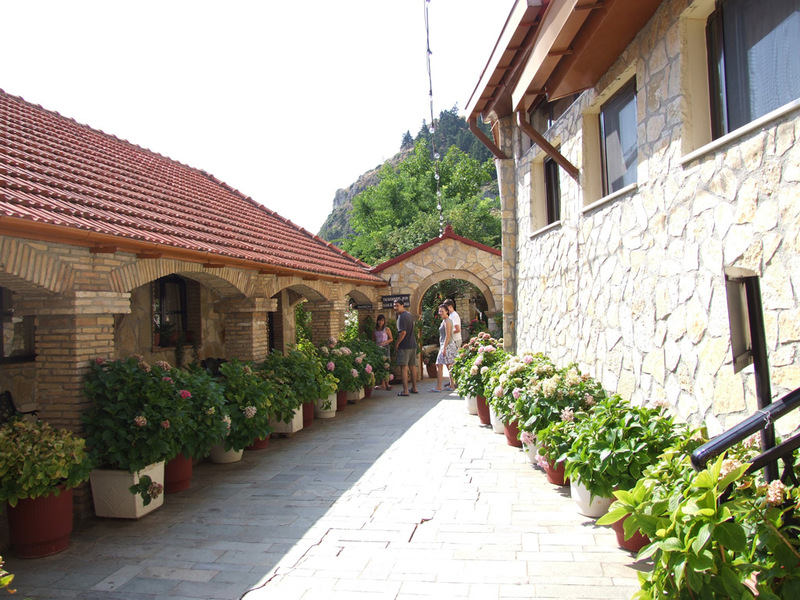 To reach the monastry follow the road to Mesaia Trikala, then turn right at the sign for Karya. Continue straight, then take a left turn at the sign for Feneos. The monastery is perched on top of lake Doxa. 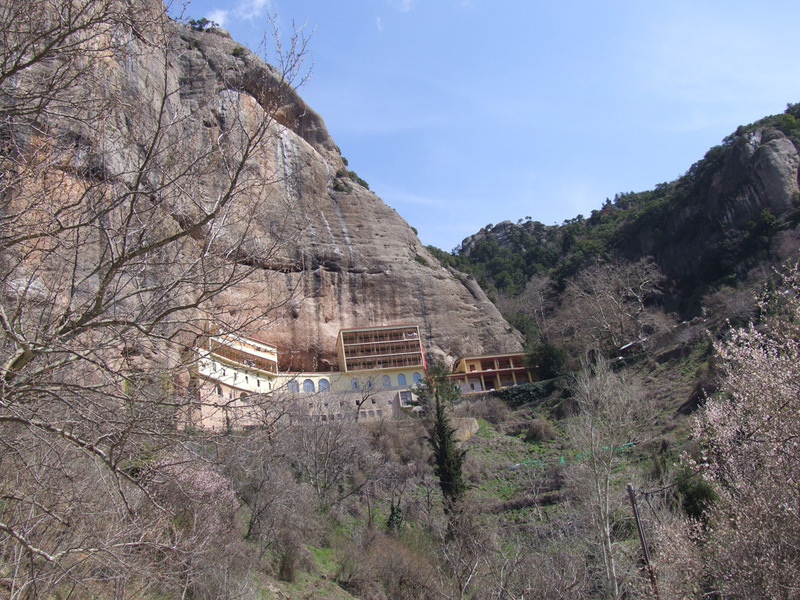 This very historic monastery is literally built in the rocks. It houses a very very old icon (4th century AD) made of mastic and wax. You can visit it on the way to the also historic mountain town of Kalavryta, site of one of the most infamous massacres of the German occupation. This is an even more historic monastery, since the Greek revolution is said to have started here. 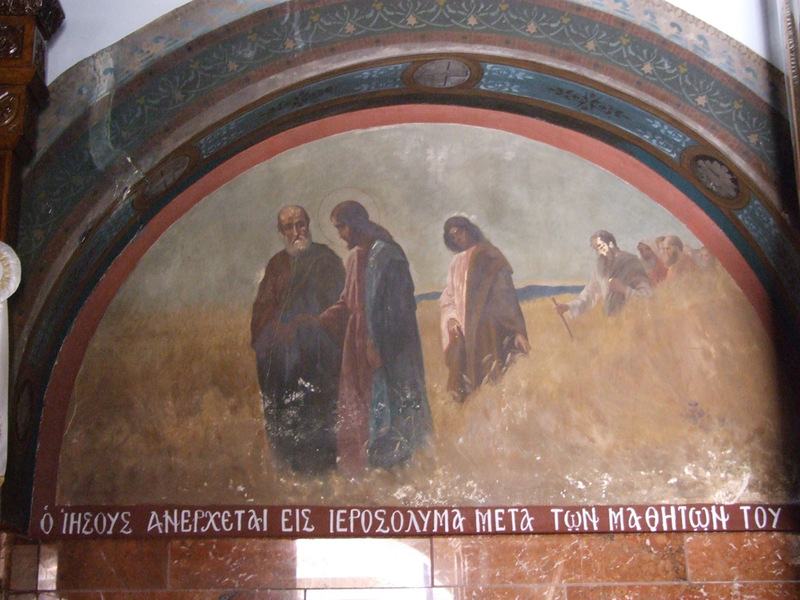 Bishop Germanos of Patras is said to have performed mess here, blessing the Peloponnesian fighters and proclaiming “Eleftheria i Thanatos”, “Freedom or Death”. 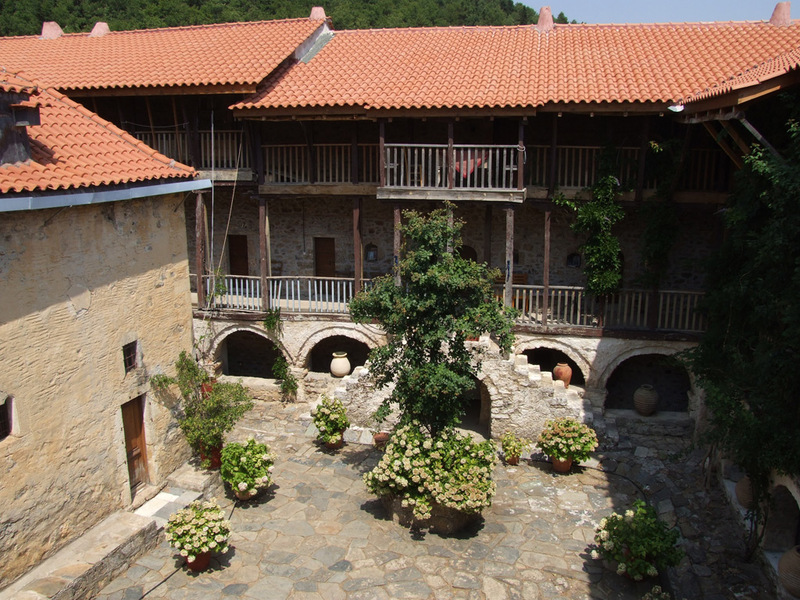 It is worth visiting this monastery on the anniversary of the Greek Revolution (25th of March) to witness the festivities that take place here. This is not the monastery of Daphne (accent on the “a”) but the monastery of Daphni (accent on the “i”)! 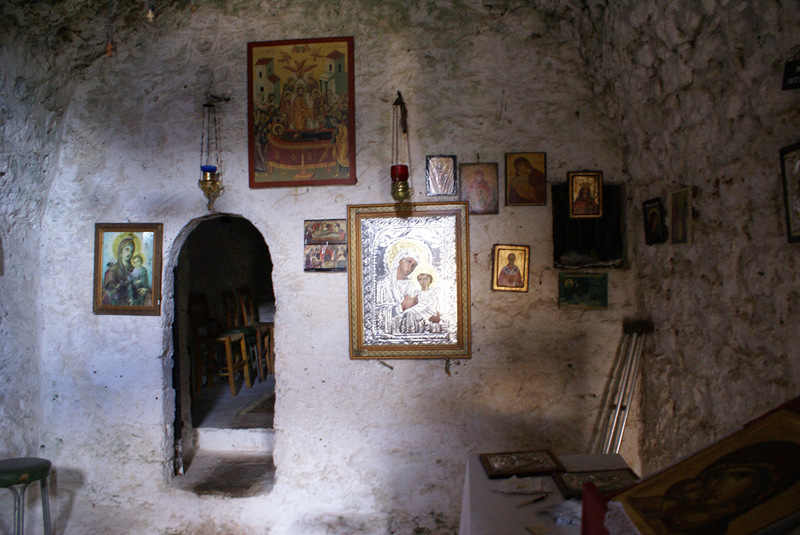 It is an 11th-century Byzantine monastery right outside Athens. Founded on the site of a Greek temple, it is now a museum and a UNESCO World Heritage Site. Daphni Monastery is one of the great masterpieces of the Byzantine Empire, especially famed for its beautiful interior mosaics. Sadly, the church has been closed for restoration work since 1999 and only the exterior can be visited. However there is a room projecting a film about the restoration work undertaken in the church, which is quite interesting. 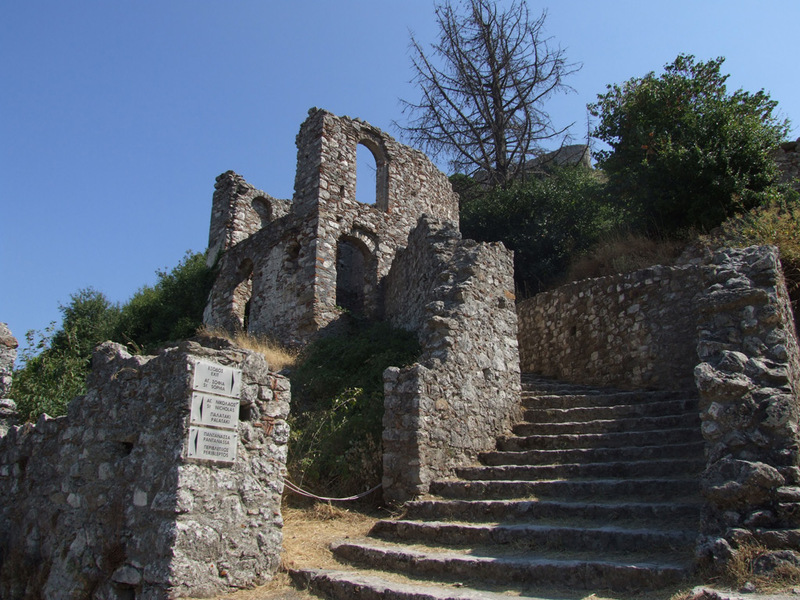 Mystras is a romantic castle dating back to the Middle Ages and Byzantium. It is aesthetically romantic and historically romantic too! Founded by the Franking leader William II de Villeharduin in 1249, it became successively Byzantine, Ottoman, Venitian, then again Ottoman, before being liberated by the Greeks after their war of independence in 1821. At the end of the 19th century it was still inhabited and was deserted only after King Otto of Greece founded the modern city of Sparta next to it. Then its inhabitants deserted it for the new city. Today you can roam around the old ruins, some of them are still standing quite well, and enter the numerous well-renovated churches and monasteries, most dating back to the 14th and 15th centuries AD. The palace is also being renovated and hopefully will soon be visitable. Mystras is a UNESCO World Heritage Centre. 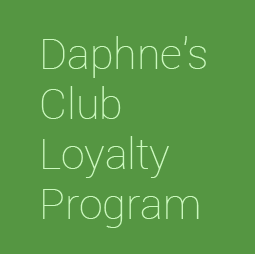 It might seem odd to you that a site so far away from the hotel has been included in this list of monasteries which can be visited from Daphne’s Club. This excursion is definetely not one to be undertaken be those who are not especially interested in monasteries or who dislike long car trips. But if you are among those who will go to great lengths to visit great places, Meteora is not a place you should miss while in Greece! Meteora (which in Greek means suspended in the air) is a complex of 6 monasteries built on high and inaccessible rocks. The first hermits arrived here in the 9th century AD. 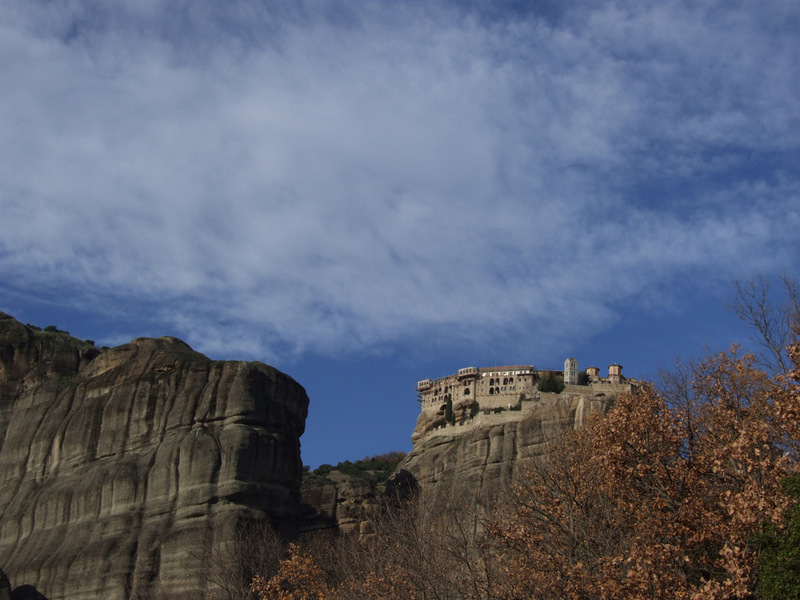 Today Meteora is a UNESCO World Heritage Site and an important site of Greek Orthodoxy.